A big part of our success is our concession volunteer base and we would like to start by thanking you for participating. This manual will provide you with the basic information about our policies and procedures. Any specific questions, which you may have which have not been addressed below, should be directed to Classic’s management team. Every volunteer plays a key role in determining the success of an event. 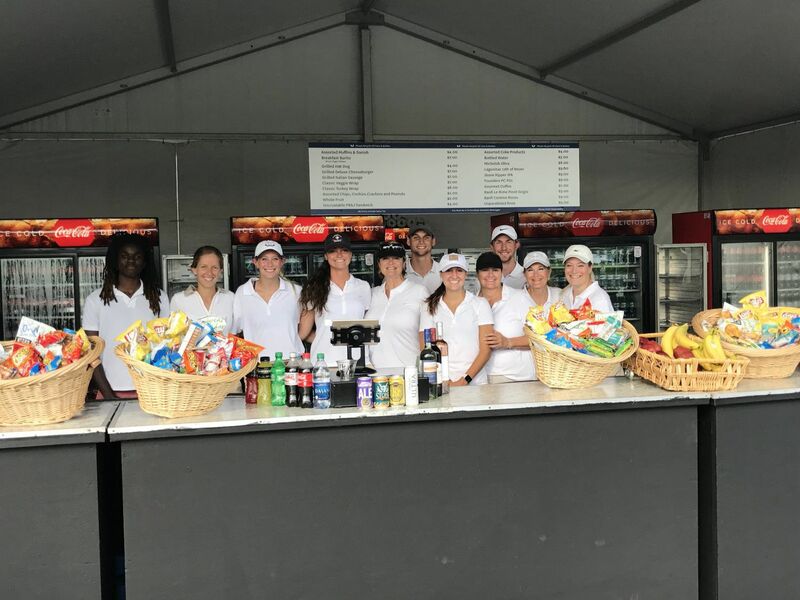 Volunteers are in charge of providing customers with food and beverage items during the tournament. This overall duty includes setting up their assigned stand, cooking/selling products, handling cash and inventories, cleaning up their assigned area, and breaking down the stand when necessary. While performing all of these tasks, volunteers are responsible for monitoring the quality and production of the items being served and determine and maintain control of the inventory and cash. This manual is intended to inform Food and Beverage volunteers of their duties and the proper way to perform them. It explains the proper procedures and also discusses sanitation, money handling, customer service, menus, and safety. Food and Beverage staff members should consult this manual if any questions arise during their assigned shift. The schedule that you have received outlines the hours of operation and staffing levels required. Please allow enough travel time to get to your location by the scheduled start time. Please contact your volunteer coordinator in advance if you have an issue with your shift. All parking for concessions is at no charge. The location of this parking area is VOLUNTEER PARKING. There will be a daily shuttle that transports everyone from this parking lot to the golf course. Upon arrival, you should sign-in on your organization sign in sheet. You must sign in to get credit for your shift. Upon completion of your shift every volunteer must checkout with the stand manager before leaving. If you leave early and do not complete your scheduled shift, your organization will not receive credit for your shift. Please plan on staying for the entire time you are scheduled. Staff members are encouraged not to bring any valuables. If you must bring valuables along to work, we suggest locking them in the trunk of your car. Shirts with the name of the organization are acceptable with prior approval. Hats must be worn at all times during food service. The shirt must be tucked in, and no stretch or gym pants are allowed. Comfortable shoes are recommended, as staff members will be standing during the entire event. Remember that personal appearance is an important part of food service. Your appearance not only affects your own image but CSC’s image as well. Good grooming and hygiene are essential. Due to the negative effect on relations with the customers, volunteers and on individual job performance, volunteers are prohibited from drinking alcoholic beverages during your shift. Theft of items from concession stands or from customers will not be tolerated. Food and beverage items are not to be removed from the concession stands at any time. It is also considered theft to refill any patron’s glass. All patrons must be given a new glass for each beverage purchase. Every staff member will receive one meal voucher per shift while working. Food should be taken outside the concession to be eaten. Per Health Department regulations, no opened personal drink containers are allowed around the food area/tables. Smoking is not permitted inside the Concession Stands. Concession staff may smoke in the designated area located outside of the stands and out of customer view. If a volunteer smokes during an approved break, they must wash their hands prior to resuming their assigned duties. CSC and its staff members operate to provide friendly, courteous, and efficient service to each and every customer. This is a business where patience and understanding are required. The ability to conduct business in a professional manner, regardless of the circumstances, is necessary for success. How patrons are treated leaves a lasting impression. Remember a smile and courtesies extended to a customer are long remembered. The following is a general list of items that should be followed when initially setting-up the concessions stand. A number of items will be discussed in detail throughout this handbook. Set out condiments, napkins, lids, etc. Make a list of any items missing and notify CSC Supervisor with that list. Check the appearance of the stand from the inside and outside! Use slow periods to prepare product for busier times and to clean and organize the stand. There is always something that needs to be done. Help others whenever possible. Cooperation results in pride and teamwork. Show courtesy towards patrons, event officials and fellow volunteers. Think Safety! Do NOT serve alcohol to minors or intoxicated patrons. No tobacco use is allowed at any time inside any food service, preparation, sales, or storage area. Tobacco use is allowed only in the designated area. CSC uses the inventory control method of accounting. Never refill any containers or give away any product or containers CSC would like to think that all staff members are honest and reliable. However, theft does occur. This reflects poorly on the entire group. These shortages show up when the balance of inventory used in the stand does not balance with money collected. Report any incident to the Manager on Duty so that the incident can be investigated if necessary. Never leave a stand unattended. When serving patrons, always greet them with a smile and end each sale with a thank you. Each staff member’s attitude will leave a lasting impression. “Up-Sell” – Always suggest larger sizes and additional items. Do the customer a favor by saving them another trip to the stand. Quality is extremely important. Do not serve any item of poor quality. Food items that are overcooked or spoiled should immediately be removed from the serving area and shown to supervisor. Every volunteer selling or handling alcohol must be at least 18 years of age. Volunteers who serve alcohol to patrons have serious job responsibilities in protecting both patrons and the event property from harm. In the United States, it is illegal to sell alcohol to a minor or to a person who is intoxicated. Safe alcohol service to guests is very important, even if the procedures sometimes make you feel awkward. The following explains how to verify legal drinking age and monitor alcohol intake. Since it can be difficult to tell whether someone is a minor or not, always ask for identification when you are ncertain. Check the birth date on the ID. It should show that the person is of legal drinking age. Make sure the person looks the age listed. Check the photo. It should look like the person. Consider the weight and hairstyle may have changed. Know how to spot fake Ids. They may have cuts, erasures, changes, different styles of type, or odd-sized seals. They may feel odd or be badly wrinkled or damaged. Use the Driver License Verification book that is provided in every stand. If you suspect that an ID is false, ask for a second ID or ask the person to give his or her address, middle name, or height, and compare the person’s answer with the information on the ID. If you still have doubts about an ID, refuse alcohol service or get a manager. It is better to lose a customer than to encounter future problems. If possible, ask a fellow staff member to watch as you refuse to serve alcohol to a customer. You may appreciate the other person's help. Talk with the guest away from others. Check the photo. It should look like the person. Consider the weight and hairstyle may have changed. Know how to spot fake Ids. They may have cuts, erasures, changes, different styles of type, or odd-sized seals. They may feel odd or be badly wrinkled or damaged. Use the Driver License Verification book that is provided in every stand. Unusual Conduct: Depending on a guest’s personality, when drinking alcohol, he or she may become overly friendly, outspoken, noisy, rowdy, withdrawn, antisocial or obnoxious. He or she may also use foul language. Impaired Judgment: When drinking alcohol, guests may become careless with their money, make foolish statements, complain or drink faster. Slowed Reaction Time: When drinking alcohol, guests may have glassy eyes, dilated pupils, or slurred speech. If you have an alcohol related issue please utilize the Event Security, Police or CSC management. Cleanliness is a top priority. A CSC staff member must make sure the stand presents a clean, pleasant appearance while maintaining all safety and sanitary standards. All volunteers must keep the assigned area free of garbage or spills at all times. During the event, the staff member will need to clean up and tidy their food operation and equipment, as well as maintain the cleanliness and organization of the counter inventory racks, prepping tables and condiment areas. NO food product should ever be placed on the floor, even if it inside of a box. All staff members must monitor production and inventory levels to ensure that the highest quality of product is being served and the highest level of customer satisfaction is being reached. All requests for additional product should go to the assigned runner or stand lead. As gallery traffic may differ, the staff member should watch product levels so that the stand is not running out through out the day. 1. Contact the runner or stand lead in one of the following ways Physically find them or use radio. Make them aware of potential needs when they check on the stand. 2. Tell them what is needed and record the item(s) and amount received on your inventory sheet. Working an event can be tiring. A short break can help refresh volunteers, thereby improving customer service. Please keep in mind that during peak service times, all lines should be open with volunteers ready to serve. All food needs to be consumed out side the stand. Eating and drinking is not allowed in the stand. This is a health code violation. All staff members must remember to wash their hands upon returning back to work. Thanks for your help with this important issue!! A finance person will come and pick up your drop. Turn off all beer signs. Check out with your supervisor. Once cash and inventory totals have been verified and cleaning of the stand has been completed, volunteers may check out and end their shift. CSC is always interested in a volunteer feedback. Any suggestions for improvements are appreciated. Likewise, if there is a concern about cleanliness in the stands, equipment or safety issues, please contact Marc D'Ambrosio at marc@classicsportscatering.com or 919-244-9551. One of the most important responsibilities of any food and beverage staff member is to practice good sanitation procedures. Many diseases can be transmitted to customers by unsanitary food handling. Stay home when you are sick, giving as much advance notice as possible. Cover cuts, burns, sores and abrasions with a tight, dry, antiseptic bandage and a glove. Keep your clothes or uniform clean at work; change your apron if you wipe your hands on it or it becomes soiled. Keep your hair clean and tied back. Use soap and plenty of hot water to wash your hands frequently, especially after any act that might contaminate foods. If you wear food handler gloves, throw them away after each use. Gloves can spread germs just as easily as bare hands. Never wash your hands in sinks used for preparing food. Completely cover cuts and abrasions with an antiseptic bandage. It is our goal to always serve the public a quality product. How food is handled during preparation and storage is very important for the safety of our patrons. Wash hands before handling food or equipment and, of course, after using the restroom. Wear the plastic gloves that are provided any time when handling unwrapped food. Do not touch food-contact surfaces, such as the rims or inside of cups or the tines of forks. Always keep the work area clean. Wipe up spills immediately. Clean as you go! Always use tongs, serving utensils or scoops when necessary. Always serve ice with a scoop. Never dip the cup into the ice bin and do not let the ice scoop handle touch the ice. Never allow cleaning towels to come into contact with food products. Store food and food containers on the racks and shelves provided. Never place food product on the floor. Keep all storage areas clean and orderly. Do not let perishable items stand at room temperatures. Store food properly at the end of the event. Anything that is to be saved must be packaged properly and cooled quickly. Remember; do not serve any item of which you are in doubt. survive and multiply between these temperatures. Serve hot foods hot and cold foods cold. Every food and beverage location must follow local health department regulations. These regulations, which are meant to make food service as safe and sanitary as possible, cover everything from making sure can openers are clean to using only health department approved cleansers. The health department conducts regular inspections to make sure the event is following regulations. Don’t consider these regulations only when it is time for an inspection, but make them part of your daily responsibilities. If a storm is approaching, weather warning signs will be displayed on the leader boards and horns will sound indicating play has been suspended due to either heavy rain or lightning. If play is delayed for rainy weather our concession stands must remain open unless severe weather arises. There will be a minimum 45-minute wait before play resumes. If play is suspended, there will be no golf played for the remainder of that day and your shift will end at that time. If you have any of these items they will be confiscated by security before entering the Tournament.